The prize-giving ceremony for the regional LafargeHolcim Awards for Middle East Africa 2017 took place in Nairobi, Kenya. Eleven prizes were awarded to honor sustainable construction projects, a majority of which were the work of female professionals. The LafargeHolcim Building Better Recognition was awarded for the first time. The first recipient? Architect Francis Kéré for his now-completed school building project in Burkina Faso. The LafargeHolcim Foundation for Sustainable Construction opened the prize hand-over phase of the fifth LafargeHolcim Awards with the celebration of the winners for Middle East Africa in Nairobi, Kenya, on 7 September. As was plain to see, building sustainably is an increasingly significant subject in this region; the majority of winning projects deal with education and the contemporary promotion of traditional manual skills. Furthermore, a striking majority of the 670 valid projects considered by the jury were designed by female professionals - in both the Next Generation and the main Awards category. Designed to recognize the innovative and forward-thinking approaches of both established architects and new voices in overcoming environmental, social and economic challenges to sustainable building, the LafargeHolcim Awards naturally keep an eye fixed on the future. In addition this year, for the first time, the LafargeHolcim Building Better Recognition was awarded to one of the completed former Awards prize-winning projects. This new prize is awarded by the LafargeHolcim Group to a project that is a particularly successful example of sustainable construction and is standing the test of time in the region. In Middle East Africa, this accolade went to renowned architect Francis Kéré for his school buildings the village of Gando in Burkina Faso, which gained him the LafargeHolcim Award Gold in 2012. In his motivational and candid speech, Kéré affirmed that sustainable construction requires an attitude that goes well beyond design and makes a difference for future generations: "Hundreds of children in Gando now have a chance to learn, as there was previously no school in the region," said Kéré who engaged the entire community to build the schools with locally available materials. John Simba, Chairman of the Board of Bamburi Cement, member of LafargeHolcim in Kenya, reminded the audience that urban populations are swelling globally by around one million people every week: “There is an urgent need to come up with clever ideas that optimize the sustainable performance of the buildings that we live and work in,” he said. Saâd Sebbar, Member of the Executive Committee of LafargeHolcim responsible for Middle East Africa, further expanded on this, adding: "Sustainability is more than CO2 and ecology, it requires working together, giving opportunities to as many people as possible: sustainability and sustainable construction are to large extent about social equity and fair chances for everybody. That is at the core of the LafargeHolcim Awards and the prize winning projects." Read about the 11 Awards prize winning projects and their design teams, including videos, photos and jury appraisals. 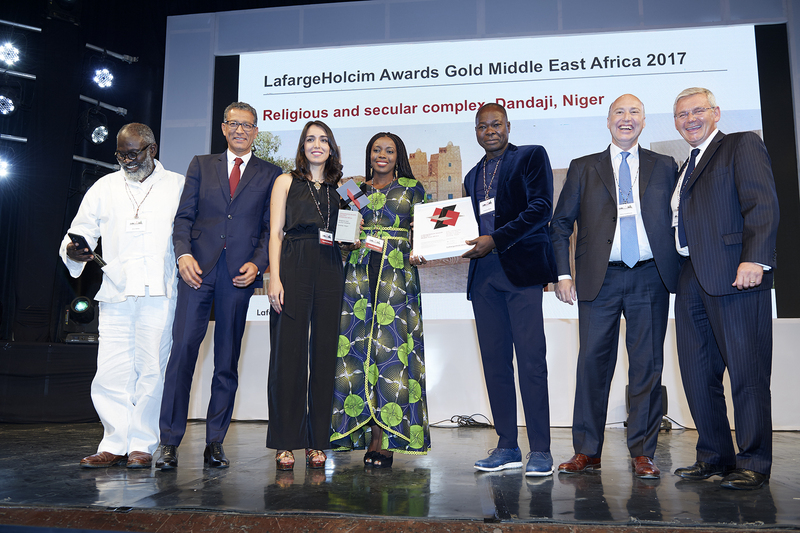 LafargeHolcim Awards Gold 2017 Middle East Africa: Religious and secular complex. LafargeHolcim Awards Silver 2017 Middle East Africa: Elementary school and craft training center. LafargeHolcim Awards Bronze 2017 Middle East Africa: Adaptive reuse for refugee education. Acknowledgement Awards, Miracle for Africa Foundation central library, Steven Holl Architects, New York City, USA. Acknowledgement Awards, Maisha Film Lab headquarters, Raul Pantaleo - TAMassociati, Trieste, Italy; Massimo Lepore - TAMassociati, Venice, Italy; Simone Sfriso - TAMassociati, Venice, Italy. Acknowledgement Awards, Shea butter storage for Nyingali community, Wonjoon Han - VHAN, Seoul, South Korea; Sookhee Yuk - Make Africa Better, Seoul, South Korea; Gahee Van - VHAN, Seoul, South Korea. Acknowledgement Awards, Odek Center for Nodding Disease, Andrew Amara - Studio Flame, Kampala, Uganda. Next Generation Prize, Brick kiln and incremental development project, Heidi van Eeden - University of Pretoria, Pretoria, South Africa. Next Generation Prize , Rubble recycling units, Nour Madi - American University of Beirut (AUB), Beirut, Lebanon; Jad Melki - GHAITH&JAD Architecture and Design, Beirut, Lebanon; Ghaith Abi Ghanem - GHAITH&JAD Architecture and Design, Beirut, Lebanon. Next Generation Prize, Designing processes for informal settlements, Nada Nafeh - The American University in Cairo, Cairo, Egypt. Next Generation Prize, Urban stair and library, Noor Marji - German Jordanian University, Amman, Jordan. There is an urgent need to come up with clever ideas that optimize the sustainable performance of the buildings that we live and work in.